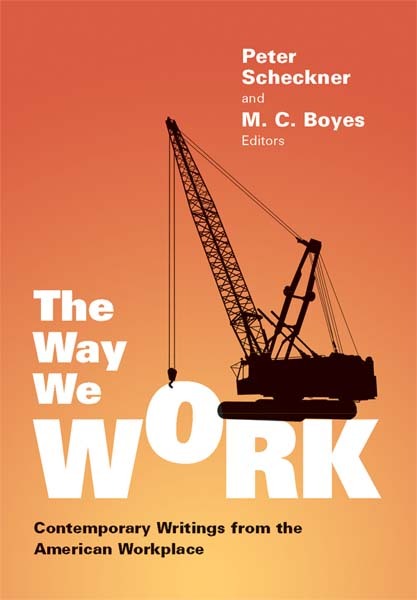 The Way We Work reveals that a seismic change has occurred in the workplace since the appearance in 1974 of Studs Terkel's Working. Terkel's subjects, despite their alienation, had a sense of themselves as workers and felt that in the workplace they were part of a community.The people Terkel interviewed were highly class conscious in a way that today seems radical and even anachronistic. By contrast, while some of the narrators in The Way We Work feel passionate about their work, others are barely conscious that they are "workers." In transit from one job to another, some workers find it hard to take either their co-workers or their job situation too much to heart. One pronoun rarely used by the narrators of the works in this anthology is "we." Each of the 43 pieces in The Way We Work represents a voice that is idiosyncratic, ironic, or humorous. Alongside such acclaimed writers as Tom Wolfe, Rick Bass, Barbara Garson, Ha Jin, Charles Bowden, Erica Funkhouser, Allan Gurganus, Catherine Anderson, Philip Levine, Edward Conlon, and Mona Simpson, appear the narratives of little-known writers. No other collection of writings about contemporary work in this country showcases the personal accounts of employees from a creative, literary perspective. These writings address such current issues as the effects of globalization, sexual harassment, racial discrimination, and the weakening of unions, as well as a general sense of worker disengagement in the workplace. Speaking in multiple genres, the men and women whose voices are collected here run the whole gamut of the workplace. From an executive at an office products company to a migrant fruit picker to a stripper to a doctor to a cleaner of garbage trucks, The Way We Work captures, with passion and honesty, the experiences of a myriad of workers. Peter Scheckner, Professor of Literature at Ramapo College, is the author of Class, Politics, and the Individual: A Study of the Major Works of D.H. Lawrence and editor of a collection of English Chartist poetry. M. C. Boyes is assistant professor of English at Virginia Commonwealth University. In 2006 she won the Tennessee Commission for the Arts Individual Fiction Fellowship. Her creative writing has appeared in Fiction International, Rhino, Hawaii Pacific Review, and Spoon River. It's a book that readers will love to pick up again and again, particularly if they have to smuggle the book onto the factory line, behind the counter, or into their cubicle to read it. I'd like to express the sense of excitement that The Way We Work generates in me as a teacher at a working-class university, where students and instructors alike would greatly benefit from the use of this book in introductory writing courses. The Way We Work goes far beyond the limits of the multicultural readers that stress human commonalties in a more sentimental, celebratory, and merely experiential way. The emphasis on work takes us to a core conception of what it means to be human and reminds us of the pressures exerted on our humanity by our present-day social and economic arrangements. The Way We Work surprised and delighted me at every turn, because of the sheer strangeness it unpacks from the dailiness and (often) stupidity of work, and even more because of the the writing's freshness. People who teach about work will want to put this book on the syllabus, right alongside Studs Terkel.